In my disappointment, I decided to try alternatives. I’m always been very impressed by Innisfree’s lip products, so I felt that it was still worth giving other products a shot. Considering that it was winter and my lips were drying out from the cold & dry weather, I went ahead to buy their lip balm. This smooth melt-in textured lip balm provides the lips with rich moisture. Gentle colors saturate the lips and give a natural and yet beautiful look. Vegetable Oil Complex* provides moisture and nourishment while holing color to keep the lips moisturized and beautifully colored for a long time. This ingredient list was so long that I balked at having to put everything in, so I just picked the one for the shade I bought (no.2). Most of the ingredients which differ from shade to shade are mostly just due to the colouring and flavour. Our top ingredient here is tridecyl trimellitate, which is rated as good by Paula’s Choice. it’s a synthetic ingredient added as a skin-softening agent and texture enhancer, which sounds pretty good for chapped lips. Our next few ingredients also serve almost the same purpose and have been all rated as dermatologically good for your skin, so you can definitely use this without much fear of irritation or swelling. 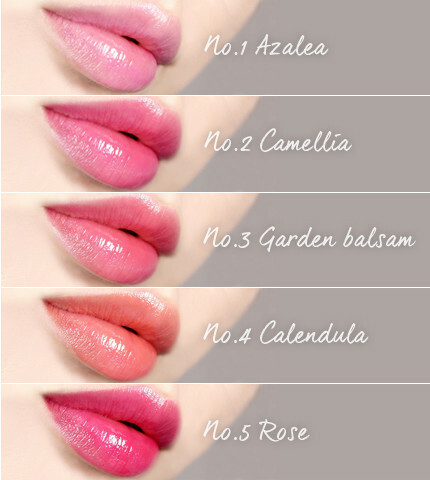 Colour: I bought shade no.2 Camellia, the same shade in which I bought the Eco flower tint in. I find the pink very easy to wear on any day with any look, and it really helps to brighten up the complexion. Colour payoff & intensity: This is surprisingly pigmented for a lip balm (see swatch above), which is also I guess why Innisfree proudly markets it as a lip tint. Texture: It leaves a nice, moisturizing gloss on your lips without feeling sticky and gross. Effectiveness: As a tint balm, I put both functions to the test in Korea – firstly to see how long it lasts, and secondly if the lip balm really helps in moisturizing the lips. On the tint side, it does not perform as well as I would want. However, considering that it is a glossy lip balm, I think it does a fairly decent job with the lasting power. I find myself having to reapply every time after I eat or drink to get more colour on my lips, but the colour generally stays on (faintly) for a few hours. As a lip balm, I think it has been pretty good. I always had to reapply lip balm almost every hour because the air in Korea was so dry, but I found myself reaching for this almost every day after I tried it for the first time. If I wasn’t overly concerned about the colour, the lip balm was capable of keeping my lips feeling decently moisturized for a few hours with no reapplication. If you live in a region that has low humidity but balk at the idea of having to reapply lip balm AND lipstick every hour, this product is for you. I think it’s priced affordably, especially considering its dual function. I’ve never found the need to use lip balm in Singapore because of the high humidity, but I changed my mind after using this one. Omg thanks for sharing this review! I actually heard of this brand and wanted to know more about it. I am looking forwards to more posts from you!